Beautiful Condo located in Port Charlotte! 3 bed 2 and 1/2 bath, built in 2005. Balcony overlooks the pool area. This condo features an open floor plan. A large living room/dining room opens onto to the 7 x 13 lanai. 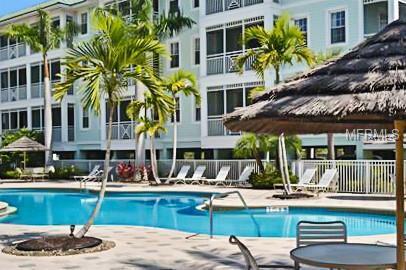 The lanai has a view of the tropical pool surrounded by palm trees and mature landscaping. The large master bedroom has its own entrance to the lanai and tropical views of the pool. There is an office area off the master bedroom. The attached master bath has dual sinks, a large walk in shower and a separate tub/shower combination. The suite is completed with a large walk in closet. There is a full size laundry room. The parking area under the building includes a designated space plus additional guest parking spaces. Additional features of the complex are a clubhouse with an exercise room, a spa in the pool area, and a putting green. HOA fees include water and sewer, cable tv, and high speed internet. Listing provided courtesy of Uptown Property Services.